If you’re not new to the safety game, it might seem redundant or unnecessary to define EHS. But in the midst of new regulations and ever-evolving tools and technology, it can be easy to forget what EHS is and where it’s heading which is in the field. What does an Environmental Health and Safety (EHS) Manager do? Of course, if you are an EHS professional you know what you responsible for but for people new to a safety position this is helpful. EHS (or SHE, or HSE!) Managers are responsible for developing, implementing, and overseeing their organization’s safety program and procedures. As you can imagine, some of these tasks are easier said than done! We're going to break this article down to cover some of the more complex responsibilities in this list and how mobile technology can make data gathering easy. First, EHS managers need to have a firm grasp of all applicable required safety regulations. The Occupational Safety and Health Administration (OSHA) has developed hundreds of standards that apply to a wide range of businesses and industries. These rules address a variety of workplace hazards, such as electrical hazards, toxic chemicals and substances, fall hazards, machine hazards, infectious diseases, and fire hazards. EHS professionals must be able to identify which federal and state standards their organization is required to comply with. In addition, EHS managers also need to keep their eye on NEW rule making. Twice a year, the Department of Labor publishes a list of all standards and regulations in the Federal Register that are being worked on. These regulatory agendas are published in the fall and the spring and provide employers and interested parties with a means to track the progress of new or changing rules. Reviewing these agendas can help you to better prepare for upcoming changes and new rule making, so that you're not playing catch up when they're released. Luckily, many safety software solutions (like ProcessMAP!) include built in features to assist organizations in achieving regulatory compliance. For example, ProcessMAP’s EHS management software ensures that its incident reporting module and its standard inspection templates meet OSHA requirements. The right EHS software will also offer a configurable design so that you can easily modify forms and reports to meet additional compliance regulations from other agencies or countries. With the rise of international standards such as ISO 45001, EHS managers need to start thinking globally, not just locally, when it comes to compliance. ProcessMAP is well versed in helping Global Companies with their compliance and reporting needs. Historically, risk management wasn’t always a significant focus of an EHS manager’s job. However, that’s changing rapidly as more and more EHS professionals introduce risk management approaches into their safety programs. In a recent survey polled over 300 EHS professionals to learn more about the top priorities, challenges, and trends in safety management. 78% of respondents named risk management as a top factor in ensuring EHS success. You can also turn to EHS management software for an effective framework of assessing and mitigating safety risks. ProcessMAP’s Risk Assessment module allows you to record and analyze hazards using a configurable risk matrix. EHS managers lead safety meetings to remind new and current employees of workplace safety procedures and EHS policies. Employees focus so much on getting their work done that they might forget some of the rules that are in place for handling certain situations. One mistake could lead to an injury, so reviewing safety policies and procedures in regular safety meetings can help a great deal. Generally, workplace safety meetings can cover a range of topics. The information that an EHS manager will review varies depending on the industry and the specific type of work performed at a location. No matter what's discussed, a good safety meeting should get employees thinking. During the meeting, EHS managers should encourage workers to come up with ideas and suggestions for minimizing the hazards with which they are most familiar. These meetings are intended to be brief so that employees can better retain the information discussed. Most meeting topics can be covered in 15 to 30 minutes. Ending the meeting with a quiz or Q&A session are also good ways to reinforce covered material. When assessing your employees or having your employee assess each other can have a significant positive impact on your safety culture. For instance work positioning is the number one issue when it comes to claims is soft tissue injury especially with craft or trade employees. You can conduct Peer to Peer or Peer to group observations. This works great when you are out in the field. Collection of these observation and then any action or corrective items assigned will keep your workers healthy and safe. Many OSHA standards contain explicit training requirements so that workers have the needed skills to keep themselves and others safe and most of the training is an annual requirement. These meetings can be delivered in many ways but the most predominant way is instructor led. With automated reporting, EHS professionals can swiftly determine the areas of their organization that are up to date with training requirements, which areas that need improvement, and can use this data to make informed decisions about their organization’s training program. If you have your employees report near miss from the field this will pay for itself in the long run. 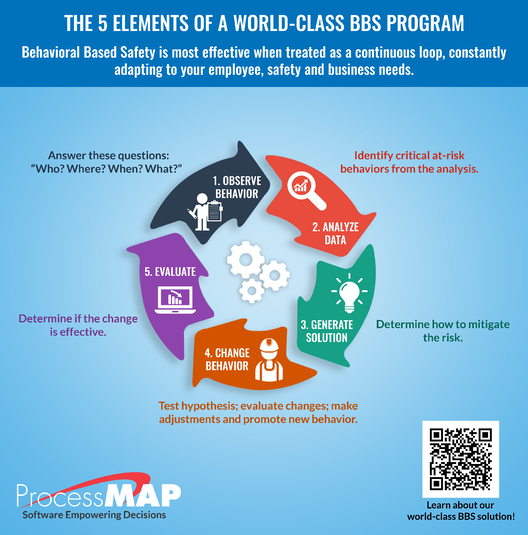 Knowing what could happen and gathering this important information can help you create better work processes will help you to close the gap on recordable incidents. With ProcessMAP mobile Incident Management application you can collect these near miss from the field quickly. Its all about the data gathering, reviewing the trend analysis and take corrective actions. Nobody wants workplace injuries and illnesses to occur, but when they do, EHS professionals are responsible for investigating each incident and developing corrective actions to prevent a recurrence. The first thing EHS managers should do when arriving at the site of an incident is to secure the area and provide any necessary assistance. An incident scene is often extremely chaotic, but EHS managers should try as much as possible to preserve the work area as it was at the time of the accident. EHS managers should then identify employees that witnessed the incident and interview them separately to learn more about what has occurred. Next, the EHS professional should document the scene and create an incident investigation report. Incident investigation can be improved with mobile incident management software, and which can even lead to preventing future workplace incidents. With mobile technology, EHS professionals can easily record their findings and take photos while they’re at the scene of the accident. Incident data can be uploaded and shared with key team members as soon as an internet connection is available. Safety software can also send automatic alerts to key team members immediately after an incident is reported. Automated updates can also be sent out to employees and supervisors as the investigation progresses. Depending on the severity of the incident, EHS managers must also then record the incident on the appropriate OSHA recordkeeping logs or report the incident directly to OSHA which is easy with e file from ProcessMAP. How can EHS Managers make their jobs easier? As you can see, EHS managers definitely wear a lot of hats! Today, EHS managers are facing increased pressure to improve safety and operational performance with fewer resources. This “more with less” mentality means EHS managers need to be strategic on how they’re spending their dollars. As covered above, by investing in EHS management software, EHS professionals can save themselves valuable time, employee lives and equipment which is an easy return on your software investment. If you're looking for a tool to help you streamline and automate safety tasks, sign up for a free demo with ProcessMAP today.